My grandparents lived at 143 Holmes Avenue in the war years, just down the road from the mill. The photo may have been taken by my Dad or his father or maybe a brother. One thing I notice is the gap between the windmill and the large tree to the right which is now filled in with the large block of flats at the top of Court Farm Road and if you look at the lower left hand side of the photo you can see a roof line with a chimney pot. I seem to remember these as being a line of farm type houses on the north side of Hangleton Road, just to the west side of the junction with Clarke Avenue. I did know a lad who lived there whose name may have been Leadbetter and I think they were knocked down in the 50s? 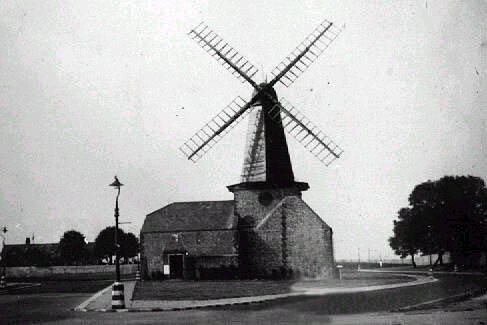 I can vaugely remember the old manor being on the east side of the windmill behind a high brick wall, and on the east side of Holmes Avenue by the last house were some high trees where a brick built air raid shelter was built which was later used by Girl Guides or something similar. I was about nine when this photo was taken. Looking yet again at the photo you can see the lampost has still got its wartime white stripes on it to help motorists in the black out during the war. There are others up the road as well. I believe the air raid shelter may have been a building used as a Civil Defence H.Q. during the war, which was rented from Hove Borough Council in July 1946 by St. Peter’s Church for use as their Parish Centre. It was used for many parochial social activities including Girl Guides until May 1941 when the Council withdrew the rental agreement. A new Parish Centre for the Church was built in 1952.